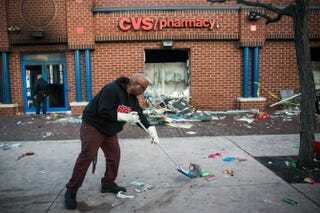 Jerald Miller helps clean up debris April 28, 2015, from a CVS pharmacy in Baltimore that was set on fire during rioting after the funeral of Freddie Gray. After the funeral of Freddie Gray Monday afternoon, riots erupted in the streets of Baltimore, sparking looting and the destruction of local businesses. Although the city has been under a state of emergency since Monday night, that did not stop residents from organizing a massive cleanup effort on Facebook and taking matters into their own hands. Here are some pictures of locals cleaning up their city.